In 2015, the Fairfield Foundation celebrated its 15th anniversary as a non-profit dedicated to archaeological research and education at Fairfield Plantation in Gloucester County and at historic sites across the Middle Peninsula and beyond. In January and July of 2015, we shared in the Gloucester-Mathews Gazette-Journal a selection of our favorite artifact finds and a sample of the wide variety of archaeological sites we’ve worked on within the last year. Now we are reflecting more broadly on 2015 and our many years at Fairfield by sharing five ways that community involvement defines the Fairfield Foundation and what we do. This will complete our effort to highlight 15 reasons to celebrate the Fairfield Foundation’s work over the past 15 years! If you don’t subscribe to our community paper, the Gloucester-Mathews Gazette-Journal (which just published a shortened version of the following article on February 11), you will find links to the previous two articles below. By far one of the greatest accomplishments of the Fairfield Foundation is not ours alone, but that of our dedicated army of volunteers, who have contributed over 60,000 hours toward the mission of our organization since 2000. 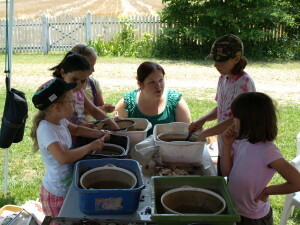 In 2015 alone, more than 200 individuals dedicated a collective 5,244 hours of their time excavating at sites across the region, washing artifacts from those and other sites, organizing fundraisers, running educational camps to introduce young students to archaeology, and much more. To put it in perspective, volunteers of all ages and from all walks of life have worked the equivalent of over $1,200,000 in wages! Many of our volunteers enjoy our weekly lab nights on Tuesdays throughout the year, which offer them an opportunity to immerse themselves in archaeological finds and discussions before returning to their real jobs. Some volunteers have even worked with the Fairfield Foundation to spearhead new projects within their local communities to bring archaeology, history, education, and preservation perspectives to new groups and new places. It may sound like a platitude, but the numbers are proof – we literally couldn’t do this without our volunteers! 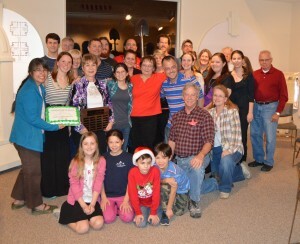 Volunteers celebrate the Fairfield Foundation’s 15th anniversary at a recent holiday party. The Fairfield Foundation strives to make an impact on our community by opening the doors for students of all ages to engage with local history through archaeology. Over 100 individuals, a mixture of students from local high schools and colleges across North America, have completed internships with our foundation, which provide an immersive, multi-week experience in the world of history and archaeology. “I learned that archaeology is a far more complex business than simply digging holes,” reflects Mike Novak (intern summer 2015), and that “local non-profits like the Fairfield Foundation do important work, keeping local history alive in ways that the ‘big money’ projects just can’t do.” We’ve also worked over the past few years to increase our interactions with local schools in order to keep local history alive as Mike noted. Last year we worked directly with Bethel Elementary School, Page Middle School, Gloucester High School, Gloucester Montessori School, Lee-Jackson Elementary School, Thomas Hunter Middle School, and the Spratley Gifted Center in Hampton, in addition to summer camps at Abingdon Glebe and at Beaverdam Nature Park. Our goal moving forward is to expand our efforts with local schools so that we can reach every student and help teachers make Virginia history come alive. 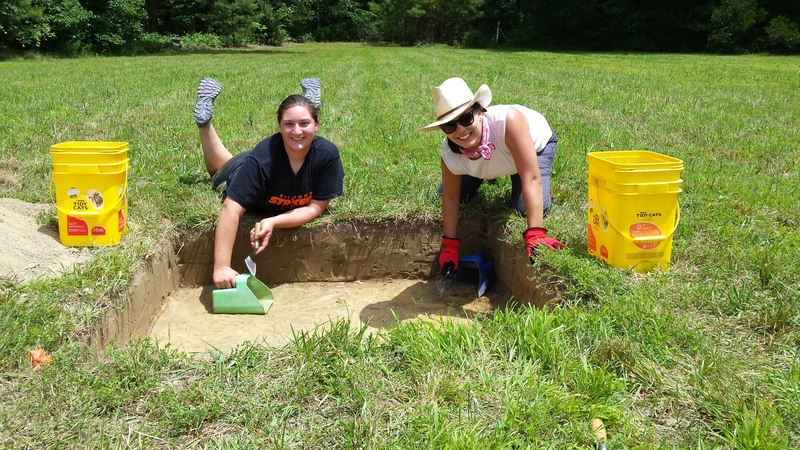 Our expanded programming and volunteer opportunities across the region may cause some to forget we continue excavations at the ancestral home of the Burwell family near White Marsh in Gloucester County. 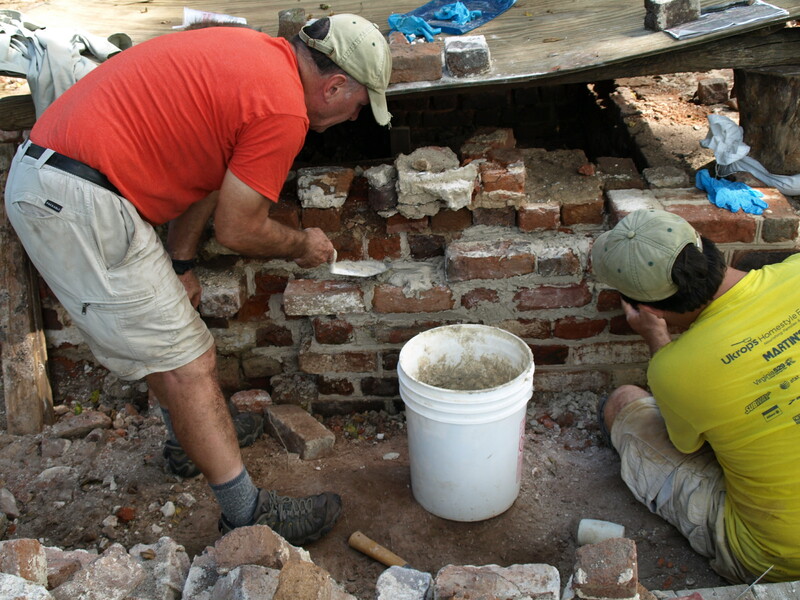 Fairfield Plantation continues to reveal its secrets each summer as our interns, Adventures in Preservation “Jammers”, and volunteers help with excavations around the 1694 manor house and in the kitchen trash midden a short distance to the west. Work in the midden this last year focused on the analysis of the artifacts as much as their excavation – and largely due to the hard work of Colleen Betti, a Ph.D. student in Anthropology at the University of North Carolina, Chapel Hill. 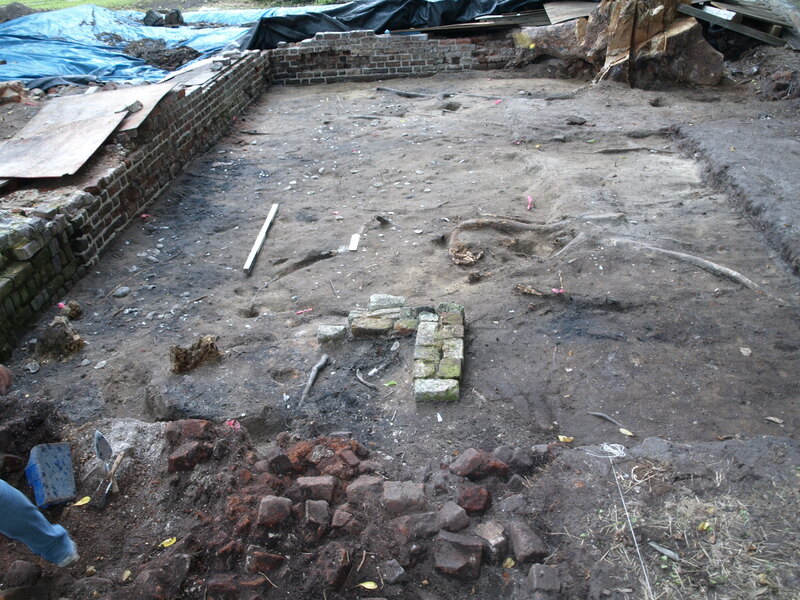 Colleen’s work is leading us to a better understanding of what went on in the work yard, which included the plantation kitchen and several slave quarters. Closer to the house, we spent two weeks excavating the layers of soil and brick rubble from the house’s destruction in 1897. Beneath this debris are remnants of the brick foundation, which historic brick mason Jason Whitehead evaluated and is skillfully repairing with the help of some of the workshop participants. 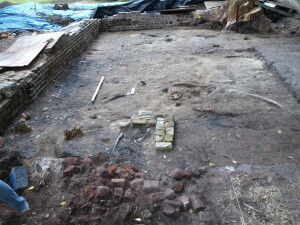 We also discovered the piers to the 19th-century brick porch, which were built directly above a filled-in cellar entrance. A layer of ash and charcoal also contained pieces of the front door lock, hundreds of iron nails (galvanized by the fire and nearly perfect looking), and fragments that mended into a near complete bottle of beer from the Globe Brewing Company in Baltimore. We can’t wait to return to the field and continue this work, and who knows what other discoveries we might make in 2016? After removal of hundreds of pounds of brick and mortar rubble, the base of a brick pier that supported the side porch became visible. Collaboration is at the heart of our outreach projects. Whether we are working with schools, civic organizations, volunteers, historical societies, landowners, volunteers, or professionals from a wide spectrum of fields, we forge collaborative partnerships to more effectively study the past and communicate this work to the public. The past belongs to all of us, and there are many people in this region who dedicate themselves to preserving and studying history. By teaming together we can be more effective at highlighting and researching the people, places and stories of the Middle Peninsula and beyond. Over the past fifteen years we have worked with a wide variety of groups in the area on projects ranging from public archaeology experiences and oral history projects to local history events and classroom outreach. The partnerships are too numerous to detail in one article, but we can highlight a few. One of our longest-running partnerships is with Gloucester County Public Schools. Over the years we have done everything from classroom visits, field trips to Fairfield and other sites, as well as working with juniors and seniors on research projects. The students have ranged from 2nd grade to 12th, and they challenge us to effectively teach history in different ways. Archaeology allows us to bring hands-on experiences to the students, and they always have brilliant questions and observations about the past. A highlight of our work with the schools is the Save Our History program, a project completed through a grant from The History Channel. 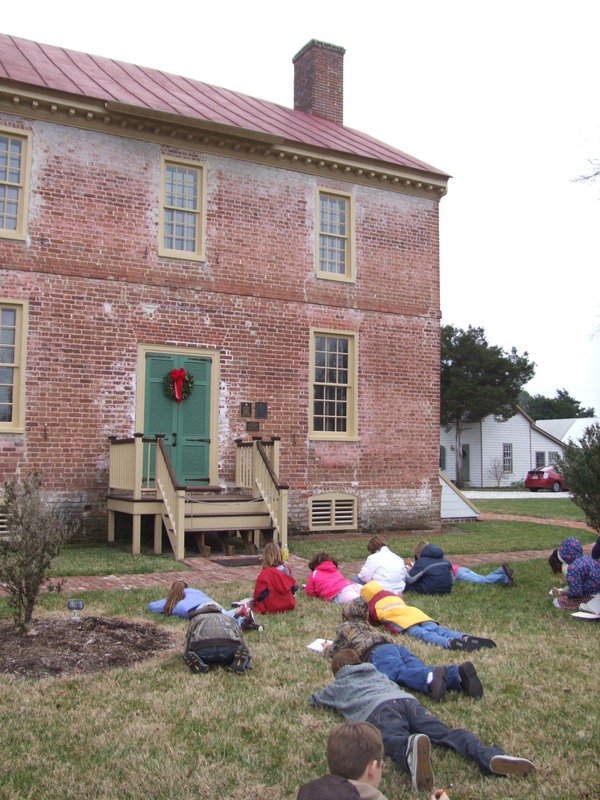 This project allowed us to plan classroom time and field trips to several historic sites around Gloucester with the students participating in observing, documenting, and taking video footage of the sites. Another important partnership is with the Archeological Technician Certification Program. This program is already a collaboration between the Archeological Society of Virginia (ASV), the Council of Virginia Archaeologists (COVA), and the Department of Historic Resources (DHR), and is designed to give individuals the opportunity to be recognized for intensive training in the techniques and goals of archaeology. Each student is provided technical training in both the field and laboratory along with a host of lectures, workshops and required readings. The program is intense, requiring many hours in the field and lab, and can take several years to complete. It takes dedication, but also allows us to work very closely with participants. Partnering with our local Middle Peninsula Chapter of the ASV, the Fairfield Foundation has been able to offer many experiences to students, and they have worked with us on nearly all of our excavation projects. We have worked closely with at least 7 students who have completed the program, and have an equal number working on their requirements now. These certification students have been some of our most dedicated volunteers, and become amazing ambassadors for collaborative archaeology and public outreach across the state. We want to thank all of the partnering groups that we have worked with over these fifteen years. Together we make a great team! Preservation is a big part of what we do. From artifacts to oral histories, to brick foundations, we strive to preserve part of the past so that it may continue to be enjoyed for present and future generations. Our two primary preservation projects are at Fairfield plantation, and at the CAPE on Main Street in Gloucester. At Fairfield, preservation takes two forms: curating, studying and archiving the artifacts and information that we excavate, and preserving in place the features and foundations that are still in the ground. Once we collect artifacts from the ground, they have much to tell us, as long as they are cataloged, carefully handled, and curated so that we may continue to go back to them when we have new questions and other objects to compare them with. An artifact’s work is never finished. The features and foundations we discover in the ground we often leave in place, so that future archaeologists can study them. To do this, we usually rebury them, but the brick foundations of the manor house present a special challenge. The brick is fragile and degraded, but is also a great teaching tool about colonial architecture and life. Rather than cover over the foundations, we have embarked on a multi-year program to repoint the mortar joints, repair the exposed walls so that they are stable once again, and eventually cover the foundation with a protective structure that will give visitors the impression of the former manor house while allowing further interpretation and study. This educational structure will be the centerpiece of our ongoing archaeological outreach at Fairfield. Meanwhile, the CAPE project is our ultimate collaboration and preservation effort. 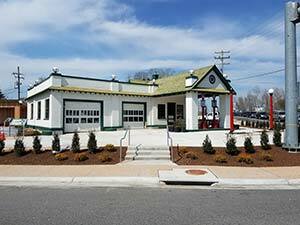 When completed, the Center for Archaeology, Preservation and Education (CAPE) will be our archaeology lab, volunteer center, and foundation headquarters, as well as a place for the community to gather, work on projects to document and share local history, stage exhibits, and more. 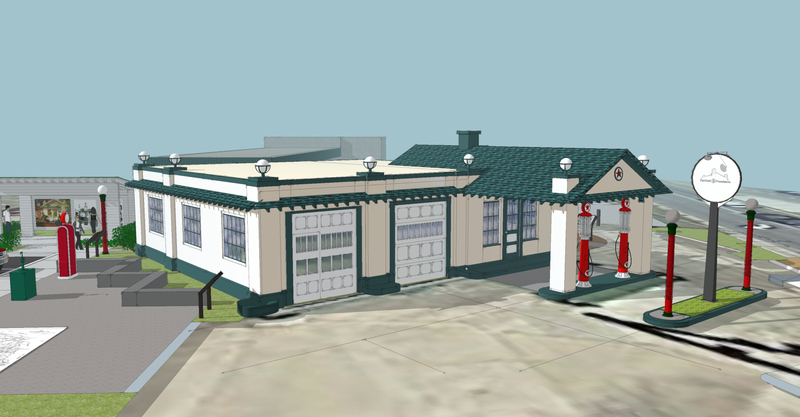 This 1930 Texaco station, a local icon at the entrance to Main Street in Gloucester, will be transformed into a modern center for local history, while retaining its historic character. The preservation of this building has involved many local craftsmen, and the efforts of dedicated volunteers. Many of the original features of the building, inside and out, are being preserved, while other historic elements, such as roof globes, gas pumps, and street lights are being returned, so that this building will blend the old and the new while allowing the Fairfield Foundation to continue expanding its many programs to study and preserve local history. The final stage of work on the CAPE is beginning soon and will be completed by the middle of 2016. 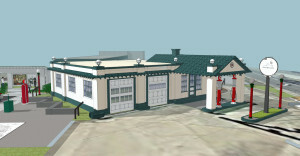 A SketchUp rendering of the completed renovations at the CAPE, by Ricky Wiatt of Carlton Abbott and Partners. Don’t panic if you missed the first two installments of our 15 year anniversary highlights! You can read the initial article on five fascinating finds here and catch up on the second article on five fascinating sites here. As always, email us at fairfield@fairfieldfoundation.org if you’re interested in joining any of our activities – which you can read about on our events calendar or by liking Fairfield Foundation on Facebook and following @Fairfieldfound on Twitter!